The Gulshan-i ‘Ishq (The Rose Garden of Love) was written in 1657 by Mulla Nusrati at the court of Sultan Ali Adil Shah II in Bijapur, one of the most important Deccani sultanates in south central India. The sultan was a great patron of the arts and was himself a musician and writer. The text takes the form of a mathnawi or narrative in rhymed couplets in Deccani Urdu numbering more than 4,500 double verses that remain largely untranslated. The plot follows a well-established love story that that was familiar to both Indian and Persian audiences and was illustrated for about 150 years at a number of different production centres that catered for the demands of different patrons across the Deccan. Told through the prisms of Hindu romance and Islamic Sufi mysticism, the story follows a well established model in which the protagonists’ experiences of love are presented as spiritual challenges to be overcome on a path to spiritual enlightenment. In this folio we find prince Manohar whose earthly wanderings and quest for love with his dear princess Madmalati unfold as an allegory for spiritual progression and divine devotion. 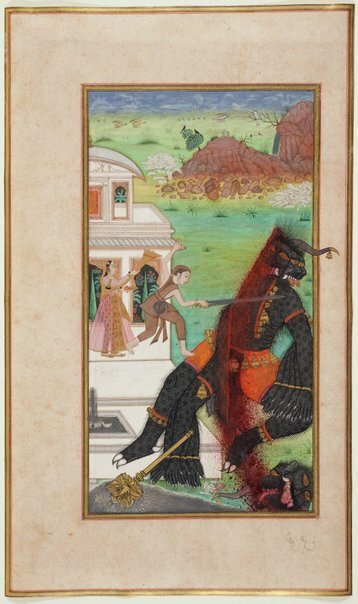 Devastated by princess Madmalati’s rejection, he wanders the earth as a yogi until he comes upon princess Champavati who is held captive in a garden pavilion by a grotesque multi-armed, multi-headed demon. While the themes of the Gulshan-I ‘Ishq were well established, Deccani paintings demonstrate a marked difference in the visual representation of romance to that found in Mughal manuscripts of north India. In order to convey the complexities of human relations and the fragility of love, painters found new pictorial techniques including colour symbolism and the rendering of landscapes as psychological spaces. Here the white walled pavilion stands in strong contrast to the green and red hues of the surroundings, and albeit a site of abduction, the pavilion is an oasis in the rocky landscape. A lush and tranquil garden, complete with fountains and roses, recalling the title of the manuscript can be seen through the ornate decoration of the window. Beyond the pavilion’s white surfaces is an eerie and almost unearthly battleground. This is no place for life. Even the birds are seen fleeing the scene. This barren landscape, littered with piles of rocks, bones and the naked branches of trees presents a hostile and uninhabitable environment and symbolises spiritual desolation. In this folio the prince strikes down the enormous demon, while never entirely leaving the architectural geometry of the pavilion’s terrace. In the previous folio (accession number 303.2016.1) the prince can be seen brandishing his sword and exchanging angry words with the demon while princess Champavati, protected by prince Manohar fans him with admiration. Later in the story the rescued princess Champavati helps to reunite prince Manohar with Princess Madmalati, providing both an earthly and spiritual reward for his ascetic wanderings and heroic deeds. In addition to the analogies of love with spiritual enlightenment, the painter’s juxtaposition of the idyllic pavilion replete with rose garden against the rugged landscape may have been designed to contrast the courtly sophistication of the Deccani courts with the violence of Mughal conquest. Such an illusion would not have been lost on viewer’s who may have witnessed the destruction of the city of Bijapur by the Mughal emperor Aurangzeb in1686 and were keenly building a new cultural centre in Hyderabad where these folios were produced. Matt Cox, Look , 'Miniatures from The Rose Garden of Love', pp 26-28, Sydney, Mar 2017-Apr 2017, 28 (colour illus.). Into the Indian Mind. An Insight through Portraits, Battles and Epics in Indian Painting , London, 2015, 42, 47 (colour illus. ).